LOS ANGELES – With jurors saying they were hopelessly deadlocked, a judge declared a mistrial Thursday in the federal corruption trial of former Los Angeles County Sheriff Lee Baca. The mistrial came on the fourth day of deliberations by the six-man, six- woman jury in downtown Los Angeles. Earlier in the day Thursday, attorneys in the case had a nearly hour-long series of private, sidebar discussions with the judge that at times included one of the jurors and Baca. At the time, there was no public announcement of what the discussions entailed, despite objections from some members of the media in the courtroom audience. The jury went back into the deliberations room around 2 p.m., and within 30 minutes, they sent a note to U.S. District Judge Percy Anderson, who brought the panel into court. Jurors then announced they were hopelessly deadlocked. Anderson asked the panel if additional deliberations might break the logjam, but jurors unanimously indicated that further discussions would be fruitless. Anderson declared the panel “hopelessly deadlocked” and dismissed the jury. The judge suggested that the “complexity” of the case, particularly difficulty grasping the concept of “intent,” played a role in the jury’s inability to reach a decision. He said he also considered possibly effects of exhaustion. One juror told reporters the panel was split 11-1 — in favor of acquittal. The jury deliberated for a total of about 24 hours over the course of four days, following roughly two weeks of testimony. Prosecutors will have to decide whether to seek a retrial on the charges of obstruction of justice and conspiracy to obstruct justice. Representatives for the U.S. Attorney’s Office declined to immediately comment. Anderson scheduled another hearing in the case for Jan. 10. “The nature of this jury’s intense scrutiny of the whole facts in the case was extraordinary,” Baca said. One juror said she couldn’t find a “smoking gun” proving Baca’s guilt. Baca is accused of conspiring to commit, and committing, obstruction of justice from August to September 2011, partly stemming from the incident in which two sheriff’s investigators confronted the FBI agent in the driveway leading into her apartment and falsely told her that they were in the process of obtaining a warrant for her arrest. The charges against Baca focus on a period of time five years ago when sheriff’s deputies based at the Men’s Central Jail stumbled upon the FBI’s secret probe of alleged civil rights abuses and unjustified beatings of inmates within jail walls. After guards discovered that inmate Anthony Brown was secretly working as an FBI informant, they booked him under false names and moved him to different locations in order to keep him hidden from federal investigators who wanted to use him as a federal grand jury witness. Prosecutors contend Baca so resented the federal government’s secret jails probe that he attempted to force the FBI to back down by illegally having deputies confront the agent. The prosecution also alleges that Baca ignored years of complaints about excessive force used illegally against jail inmates in county facilities managed by the Sheriff’s Department. Baca, 74, also faces a third count — making false statements to federal investigators in April 2013, which will be the subject of a second trial. Prosecutors contend Baca lied to the FBI about his knowledge of department efforts to subvert a federal probe into corruption and inmate abuse in the jail system. The judge split the trial into two parts after he agreed to allow testimony by an expert on dementia — but only as it relates to the false- statements charge. Anderson agreed to hold a separate trial on those counts so the jury could hear the medical testimony. Baca is in the early stages of Alzheimer’s disease. In closing arguments in the trial, a prosecutor told jurors that Baca “authorized and condoned” the conspiracy, but the defense threw blame on Baca’s former second-in-command. 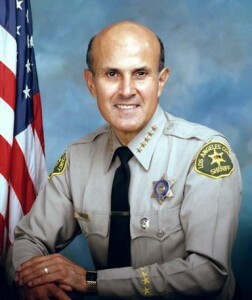 In his summation, Assistant U.S. Attorney Brandon Fox told the six-man, six-woman panel that during Baca’s years as sheriff, he “abused the power given to him by the people of Los Angeles County” by ignoring evidence of brutality against jail inmates and working to ensure “dirty deputies” were not brought to justice. “He wanted to ensure that no outside law enforcement would police the jails,” Fox said. Jurors also heard accusations from the prosecution that the retired lawman was the “heartbeat” of the sheriff department’s illicit response to the federal grand jury probe. Hochman countered that it was former Undersheriff Paul Tanaka who was to blame for the department’s actions. The then-sheriff “was not the driving force,” Hochman said, telling jurors that Baca had no idea that Tanaka was running things. Tanaka was sentenced to five years in prison and is expected to begin serving his time next month. Hochman told the jury that the government had “completely failed” to prove its case and had included graphic testimony of jail violence “to poison your mind” against his client. Baca retired in 2014 at the height of the federal probe. He had been sheriff since December 1998. 14 comments for "Baca corruption trial ends in mistrial as jurors deadlock"
Great job Federal DOJ. The problem is always is there a clear line to the top of any organization in this case LASD jail operations. Other issues is the feds can do this over and over again, so it is NOT over. The Feds do not have a limit like California 3 times and it’s over. They should of offer federal immunity or reduced sentence others like other high prolife cases/ investigations. Maybe someone could have connected the dots for the feds. Do I think he was involved SURE but can you provide it in court that is other issue? No federal wire taps? No emails? I would love to see the transcript on this trial. Great job! Obama’s Justice Dept. took a shot at Sheriff Baca as part of their effort to undermine and weaken law enforcement in America. They won’t get a second shot at him because President Trump is going to put an end to that nonsense. Criminals will be put in jail where they belong, illegal aliens will be deported, and America will be Great Again! Unless the criminals have badges, of course. In that case Mike doesn’t think they deserve jail, just a personal baton polishing from Mike himself. Oh boo hoo. Another dirty cop using every trick in the book to get off. Of course, ALL pigs consider any other person using these same tactics as scum, filth, criminals, undeserving of mercy. Baca is even using the time-worn health problem gambit – to get out of his corruption – that mobsters use time and time again.Coward, (like anybody who hides behind a badge), go do your time tough guy. How many people did baby Baca and his crew of government sponsored thugs railroad into a prison cage? This dude deserves NOTHING but contempt, and no mercy whatsoever. Done, have fun in prison playing tennis tough guy. agreed… i see their point of view, They are criminals so who cares? But what if your son or daughter made a mistake and ended up in there? Want deputies beating on them? I dont care how old he is if he committed these crimes hes accused of then he deserves to spend time in jail just like the rest of us! Can you smell the police state? America is a joke and should quit pretending how wonderful and free the U.S is. Game up, nobody else believes it. That’s a defense that even if it is true doesn’t deserve to hold up. I feel blessed that it was a mistrial I hope that they do not retry him. Mr. Baca deserves to live out his remaining years with his famil in peace. I know god will continue to protect him. God? As opposed to the gang of thugs he used to run with? Yo’ Free the officers. You gotta be a fu!! !king cop. You ever stop and actually listen to yourself? Free the crooked pigs and jail everybody else? Is that correct? Please spontaneously combust-it’d make a great Christmas present for so, so , so many people. Did we ever see Mr. Baca’s mug shot?? It should, at the very least, be shown alongside that snazzy portait we see every day.